Our Center is a Jewish community organization whose main objective in realization of all our projects is to work with the Russian-speaking Jewry of Haifa and Krayot. The Center organizes Holiday Celebrations, Passover Seders, and Shabbos meals. Also, the Center does work in the public sphere: helping fill out and file documents with the public and government organizations. Further, the Center conducts lectures, seminars on Jewish tradition, educational and cultural gatherings. In the Center, Yidden are given assistance in fulfilling mitzvot such as the circumcision, bar-mitzvah, chupah, etc. The work is conducted in all spheres and with all layers of population. All work is carried out with love, and with the feeling of obligation to help their brethren. A few years back, a group of Russian-speaking Jews gathered in Haifa for the first time in a facility located at the corner of 7 Arlozorov Street. And this very location became the ‘base’ of the Center for the Russian-speaking Jewry of the city of Haifa and its surroundings. From 2004, in various locations throughout Haifa, the activists of the Center started conducting regular Torah lessons. We never had a problem with a ‘minyan’ for the morning and Shabbos prayers, as well as conducting ‘farbrengens’ and Chassidic receptions, which gathered up to 600 people. All these years systematic initiative was put forward to attract the youths to our activities. Afterwards, the Center moved to a new, more spacious location, on 56 Hertzel Street, where it is currently located. This was very important at the time because we reach out to Russian-speaking Jews, not only recently-arriving repatriates, but also those who have been living in Haifa for many years. In the year 2005, a Certificate was issued confirming official registration of the Center with the Ministry of Justice, and a year later permission was received for legally acknowledged work. 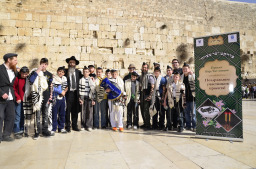 From the year 2006, the ‘Chabad - Lubavitcher Center for the Russian-speaking Jewry of Haifa and Krayot,’ started working officially as an organization.